Part 1 : Experience the magical sounds of the Singing Bowls, their history & use in meditation, relaxation & deep listening practices and learn the various techniques of making the bowls sing. Their rich sonic vibrations alter space, mind, and time. Please bring your own bowls (not compulsory). 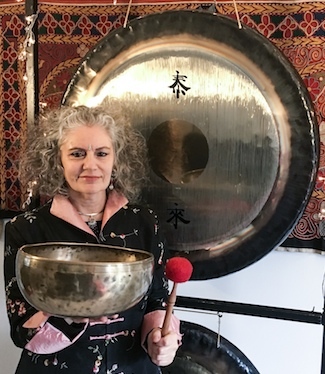 Michael & Candida are expert Tibetan Singing Bowl practitioners having been blessed in 1995 to lead sound Meditations by the Venerable Khamba Lam Choijampts, The Abbot of Gandan Monastery, Ulaanbaatar, Mongolia which they have been doing for the past 23 years. Michael is the main workshop leader for the “Colourscape” structure where he leads therapeutic sound sessions with children and adults with autism, downs syndrome, moderate to profound and multiple learning difficulties. He has found Tibetan Singing Bowls as profound instruments of joy and transformation. They have played for His Holiness the Dalai Lama, as well as the Tibet Foundation and the Tibet House Trust. Over the years they have performed in concert with the Tashi Lhunpo Monks Tibetologist Alain Presencer, Gongmaster Don Conreaux and Frank Perry.